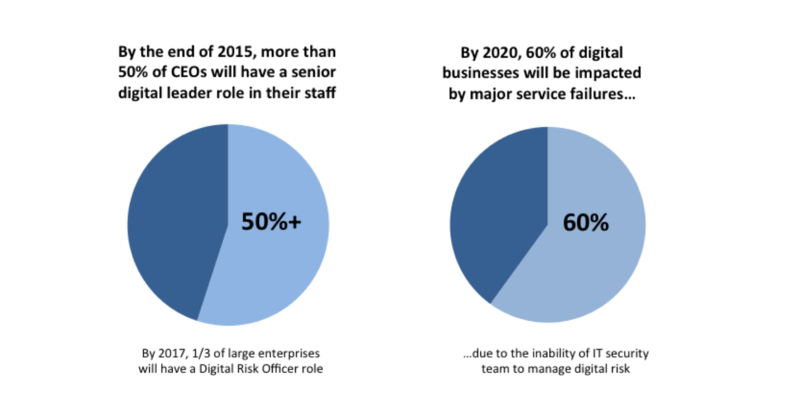 In the brave new world of digital risk management, a Chief Information Security Officer (CISO) would report up to a Digital Risk Officer (DRO) who manages risk from a business perspective and works with peers in business ops, compliance, and IT security. The business processes in the enterprise and in government organizations have become “digital” at an accelerated pace in the past few years. In most industries, many functions that were conducted on premises or were paper-based are now being performed online via digital processes. While this trend has led to a dramatic improvement in productivity, it has also led to a new set of risk factors that extend beyond the familiar threats to traditional IT systems. At the Digital Risk Management Institute we agree with that prediction. In our view, the ultimate goal for DRM is to build “digital resiliency” into an organization’s systems and operations in that they are designed from the ground up to detect threats and respond to events that minimize business disruption and financial losses. While many CISOs might want to evolve into the role of DRO, they would have to grow in a few dimensions to get considered for the job. They’d have to understand their company’s business function and develop some level of business expertise in order to speak the language of business executives, articulate digital risk factors in operational and financial terms, and provide recommendations on risk mitigation initiatives. In doing so, they would need to be keenly aware of their role in developing a new risk management culture across functional silos and start forming partnerships with a new set of functional leaders within the line-of-business including sales, marketing, operations, and legal. The cultural gap between business executives and IT leaders presents a real challenge for many security departments. Business executives for too long have believed that technology-related risk is a technical problem and have delegated it to technical people operating in IT, separate from the business. Technical people don’t understand their organization’s business function well and don’t know how to articulate risk in financial and operational terms. This has led to situations where business executives don’t understand the problem and where technical people blame executives for insufficient attention and funding of their security initiatives. Nick Sanna is the President of the DRM Institute, a not-for-profit organization formed to identify and communicate best-practices for managing digital business risk. Previously, Nick served as CEO and COO of enterprise software and services companies in IT security, IT analytics, and performance management.